SkyBahamas Airlines Ltd. The Premier Regional Airline of The Bahamas. SkyBahamas Airlines Ltd. first began with regular flights into Exuma in 2008 after acquiring Sky Unlimited. 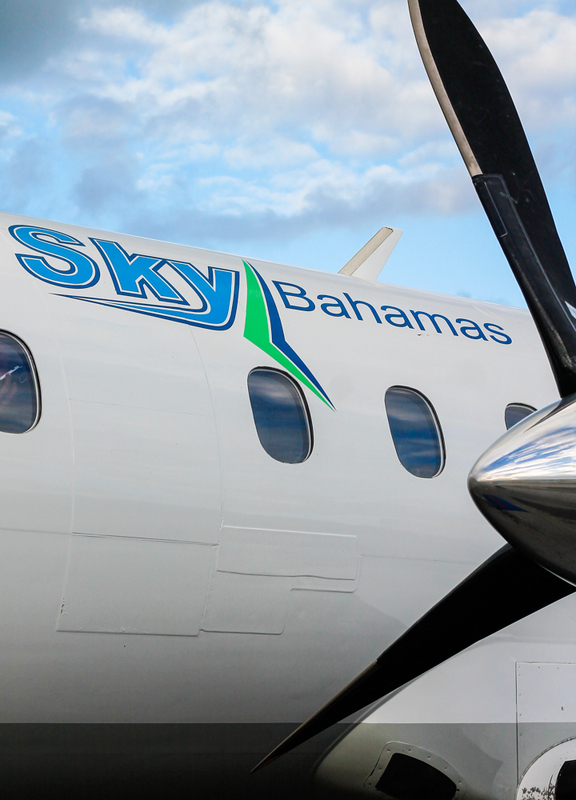 Today SkyBahamas not only continues service into Exuma but has now expanded its routes to Freeport, Grand Bahama; Marsh Harbour, Abaco; New Bight and Arthur's Town, Cat Island. Each of our flying destinations has proven to be the perfect home for Bahamians as well as a magnificent tourist attraction for visitors. With crystal clear oceans that stretch for miles, white beaches, luxurious hotel accommodations and so much more, SkyBahamas Airlines Ltd. should definitely be your first choice for airline travel. SkyBahamas Airlines Ltd. rates are always affordable. Our airline has earned a reputation for exceptional customer service. All guest service agents and cabin attendants go the extra mile to ensure that all of our customers have a wonderful flying experience, from the time the customer makes their reservation, until the time the customer safely arrives at their destination.